A few days before its first birthday Galeria Północna is celebrating another significant business success. 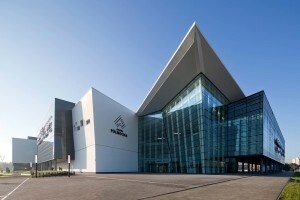 The technological company Media Expert joined the tenants of the first modern shopping center in the north of Warsaw. Opening of a new store with a comprehensive range of consumer electronics and home appliances is scheduled for 2018. Media Expert is a dynamically developing store chain with consumer electronics, present on the Polish market for over 15 years. The company is a leader on local markets, offering customers the largest selection of the products at attractive prices. The network offer includes modern smart TVs, laptops, tablets and smartphones, photographic equipment, household appliances of well-known brands as well as relaxation and garden care equipment. Bikes, scooters and even quads are also available in selected Media Expert elecrtomarkets. The high quality of service and the customers’ recognition are confirmed by numerous awards, including Grand Prix – Laur Konsumenta 2018 in the Electronics / Household Goods Stores category. “Galeria Północna provides locals with access to a commercial and entertainment offer not yet available in the north-eastern parts of Warsaw. We have been observing our clients’ preferences for almost a year and we are modifying our tenat-mix according to their needs and expectations. From the very beginning the stores offering consumer electronics have gained popularity. They are often chosen both for home shopping and for gifts. Therefore, we are pleased to inform that the retail potential of Galeria Północna has been appreciated by another significant tenant from this industry and soon our offer will be enriched by the Media Expert store. The first shop in Białołęka will be also the largest lease contract concluded in Galeria Północna since its opening” – said Jarosław Tutaj, Head of Retail Leasing, GTC. The Media Expert electromarket in Galeria Północna will occupy a substantial area of 900 sq. m and will be its fifth shop in the capital. The opening is planned for 2018. “Białołęka is a young, dynamically developing district opening interesting perspectives for companies from the electronics industry. Our competitive edge constitute a wide range of products in all price ranges and professional services that can help in adjusting the offer to customer expectations. Thanks to this, we are the perfect address for people arranging a house or flat, seekers for gadgets and original gifts as well as for electronics enthusiasts. With such potential, we have a lot to offer to customers visiting Galeria Północna” – summarizes the opening of the new store Marcin Żakowski, Head of Real Estate at Media Expert.